When I think of wedding planning I think of two things: a nervous girl trying on dresses and an excited couple stuffing their faces with cake samples. Since I already tried on dresses, I've had the cake tasting to look forward to for months! Our venue works hand-in-hand with Homestyle Desserts, a local bakery to include the cake with the reception cost. At first I was a little weary because I wasn't sure if it was a good bakery. I read some online reviews and the locals just go ga-ga over them! My nerves were settled! When we opened the doors to get out of the car in the parking lot, we both nearly fainted from the scent. There were people rushing in and out with huge white boxes full of tasty treats. The display cases were filled top to bottom with every Italian dessert, pastry, and treat you could imagine. We were ushered behind the counter to a table and given 4 slices to try. Starting at the top was Chocolate Mousse with chocolate cake and chocolate mousse. Going clockwise, next was Double Temptation, chocolate cake with cheesecake. Next was the Amaretto Cake, vanilla amaretto cake with vanilla and chocolate custard filling. Last was Cannoli Cake, an Italian sponge cake with Cannoli cream and chocolate chips. In about 4 seconds the plate looked like this. When I looked at the selections back in February I pretty much already made up my mind. The tasting just solidified that choice! Which do you think I picked!?! Long time readers might remember Johnny's surprise Fiesta birthday party last summer! We made a whole variety of tasty Mexican treats, including some chicken enchiladas. My boss Linda was at the party and loved them so much, she's been asking me for a year to make them! When I moved back in June it was the first thing she mentioned to me and I just haven't had the time until now to make them for her. Just like the party, I made a really big batch. Enough for a pan to go to Linda and enough for us to have for dinner. Please feel free to cut the recipe down if you're just making it for a normal dinner. Otherwise make a pan for now and freeze a pan (before baking) for later!! In a large high sided skillet mix together the sauce packets, tomatoes, and water. Cook over medium high heat until bubbly. Stir in the sour cream until smooth and let simmer a few minutes to thicken. Shred chicken into a large bowl. Add 1/4 of the sauce, 1 cup of cheese, and the drained can of black beans. Toss everything until well mixed. Spray two large baking pans with non stick spray. Fill each tortilla with a thin strip of the mixture down the center, wrapping to close. Place fold side down into the baking pan. Pour the remainder of the sauce over the enchiladas. Sprinkle with remaining cheese. Cover with foil and bake in a 400° oven for 30 minutes. Serve with extra sour cream. This week there are three things to celebrate around here. First -- we sold the house!! It officially closed on Wednesday, September 7th. Second -- September 7th also happened to be mine and Johnny's 5th anniversary! Third -- September 12th is Dinner at Christina's third birthday! Biz just celebrated her 3rd blogiversary too and I loved the "look back" she did. And following along as I plan our Dec. 2011 wedding! I decided to splurge a bit at the grocery store on behalf of this special week. We had a great Saturday night dinner. Massive grilled steaks medium rare, grilled onions, grilled poblano chiles, and sweet potato waffle fries. I've grown up on the east coast. On the barrier islands of North Carolina, better known as the Outer Banks. It juts out into the ocean and the widest part is 3 miles. It has seen its fair share of hurricanes. Hurricanes are a way of life here. They come and they go. Tourists freak out and are evacuated first, leaving us locals with a day or two of quiet, peaceful summertime to enjoy. I don't know a single local that evacuates. In fact, the majority of locals I know find hurricanes exciting and a chance for a "hurricane party." Businesses are closed, the tourists are gone, it's summer and you have no work. What a great excuse to kick back and have a few drinks while sitting under a porch or in an open garage while a large storm blows past! Hurricanes usually hit here from the east. The entire eastern side of the island are vacant rental homes. Nobody lives in them, rich out-of-towners own them, and they're built with strict codes to survive the wind and water. If the ocean does flood, they're on stilts and goes under them and recedes. Worst case scenario, a few fall into the ocean and NC 12 (aka "The Beach Road") floods. It's par for the course. No harm to people, and besides anonymous people nobody has ever met in far away states having to file an insurance claim for their rental home, life returns immediately to normal. 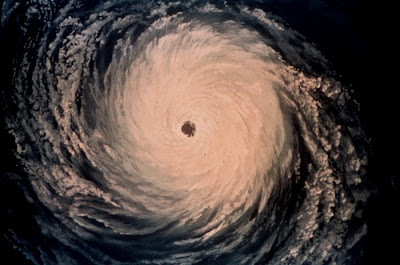 Once in a blue moon, though, hurricanes come up from the south. The water between the islands and "the mainland" are sounds. Brackish water- a mixture of ocean water and fresh water. Calm, no real tide or waves. Great for boating, water sports, and crabbing. Since it's not the prime ocean side real estate, it's also where locals live. We all know the classic hurricane look and shape. Arm bands in one direction, an eye, and arm bands in the opposite direction. 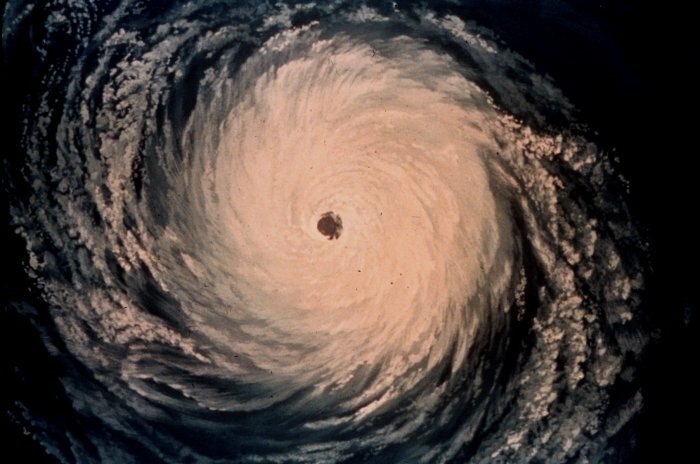 When a hurricane hits us from the south it affects the sound. That first armband blows the sound west. It's gone from here. Locals know immediately and start going to take pictures of themselves "walking on water." When I woke up Saturday, I logged on Facebook to see many photos of the sound blown out. Everybody knew it was bad news. I turned on The Weather Channel, expecting coverage. Instead, for the next 24 hours they still had that same guy 1 mile away, pretending to be blown away by the ocean. 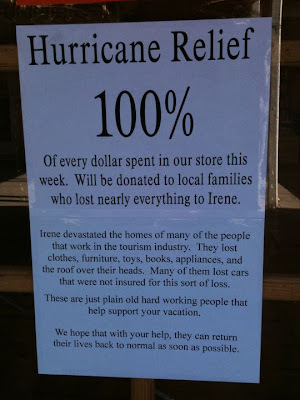 The ocean stopped being a threat the second Irene made landfall. That was evident by every person that lives here, somehow TWC just missed the memo. Or, I guess they just need the dramatics for ratings and hysteria. Saturday night the eye went over us and blew the sound back in. We knew this would mean flooding, it always does. However, nobody anticipated Irene sitting over us blowing non-stop for 16 hours. She blew the sound in, then kept on blowing. Instead of just affecting that single row of soundside homes, entire towns were under water. Not only did the sound flood, but any canal connected to the sound flooded. I have dozens of photos of homes underwater, cars up to their windows in water, and roads that became rivers. My own street was closed just a mile down the road from flooding and loss of homes. If you are my friend on Facebook you have seen some in a private album, but I just don't feel right posting them publicly on the Internet. The Outer Banks has never flooded this badly in anybody who is living's life time. Manteo was chest high with sound water. Nags Head was cut off as the sounds connected over the road. Hatteras and Rodanthe are still cut off because a new 12 foot deep inlet was created when the sound connected with the ocean. Wanchese and Colington are almost entirely condemned. Parts of Kitty Hawk with homes from the early 1900s that have never had flooding experienced 1-2 feet of water in their first floors. The photos I have seen and the destruction I see every time I leave my house to drive anywhere is unreal. I've seen photos of floods on TV or in books, I just never thought I'd see it less than a mile from my own home. The stench is unbearable in areas as hundreds of fish and crabs lay rotting a mile away from the now receded sound. At certain points it feels as if you are driving through a tunnel because debris and ruined belongings line both sides of the street as high as my car. Despite all this, city officials decided to open our borders a mere 24 hours later to returning tourists. I understand they want to put on a brave face to salvage the tourism industry, but really I feel it was a slap to the face. It was so disrespectful to the thousands of locals who lost their homes, businesses, and cars. Many cities hadn't even cleared the water from their roads, had their power or Internet restored, or evaluated the damage. Politics, I guess. Unfortunately, by silencing the damage for tourism dollars, they also silenced the call for aid that many, many locals now need. We've learned that this will be a grassroots clean up act. Truly, neighbors helping neighbors. At the very least, I can say that I'm glad to be a part of a community that has stepped up and taken care of each other the way we have. My own work was saved by chance. The businesses on either side were condemned and will remain closed until repair work is complete and they are inspected to reopen. I could easily be out of work for a few months instead of the few days I was. We were also lucky to receive no flooding. Thankfully my parents' property is tucked back in a great location with no threat from the ocean, sound, or canals. We did lose a few trees and a tenant had her windshield broken from a branch. But at the end of the day I feel lucky. Lucky to have not lost anything from a storm that I saw first hand to have taken so much from people so close. And lucky to again call myself a part of this hearty community that can show a hurricane who's boss - no matter if it takes the rare path up the sound.